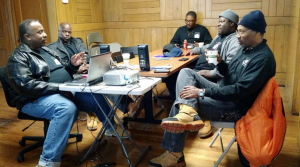 On weekday mornings at IMAN, you can find the brothers of the latest Green ReEntry cohort preparing diligently in both a classroom and workshop setting. Led by Matthew Ramadan, the new Green ReEntry crew is working toward Level 1 Carpentry Certification. The certification greatly increases opportunities for gainful employment, including apprenticeships, upon graduation from the program. Throughout the class the Green ReEntry crew is also learning critical financial literacy skills — from basic banking to investment strategies. Not only is the cohort gaining the skills and knowledge needed for personal benefit, but they are also realizing the role they play as leaders in helping to transform the community. This spirit of civic engagement was also on display at the state capitol, as several Green ReEntry brothers recently pushed for bills addressing both sentence modification for the formerly incarcerated and an increase in the minimum wage. Upon completion of the Level 1 certification, those that successfully complete the preliminary training will be selected to work on two newly acquired pro perties around IMAN’s main offices. These sites will provide valuable training experience for the Green ReEntry crew as they continue refining their craft by working to “green retrofit” each property. IMAN is also placing and preparing two new families from our pool of Green ReEntry leaders for home acquisition in 2015. 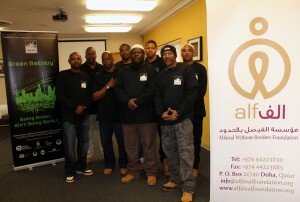 This year’s Green ReEntry training, programming and reduced-price acquisition is made possible by your du’as, the generous support of an anonymous family foundation, Al Faisal Without Borders, Islamic Relief USA and the City of Chicago Department of Planning. This entry was posted in Direct Services, One Chicago, Uncategorized by IMAN Staff. Bookmark the permalink.